IS THE WORLD REALLY MELTING? I’m sure you already know that global warming is here… We all know that. But have you ever thought about what it is really doing to our planet? I witnessed the effects of climate change on my trip in Alaska and it has made me more concerned than ever before. A vast majority of the population, including most of the people I know, are completely uninterested in climate change; have more important things to worry about or believe that nothing will ever be done to avoid the problem. Unfortunately, with attitudes like that, I believe nothing in this world will ever change. I am so very interested and passionate about making a positive impact, but myself along with the majority of the people on this planet, are unconsciously contributing to a problem that is going to sweep the world off of its feet. Alaska. A state of America with land on either side of the arctic circle aka. an Arctic nation. This state has an estimated 100,000 glaciers; 616 named and a ridiculously big handful that are yet to make the books. For those of you who are unaware of what glaciers really are, they are what occurs when the quantity of snow compared to the rate that it melts is out of balance. Basically, if there is too much snow and it’s not melting, it’s going to form one huuuuuge chunk of ice. But what makes a glacier different to just a ‘chunk of ice’ is that is constantly moving upon itself and grinding up the earth beneath it. On my one week journey through south-east Alaska, I encountered up to 20 glaciers; each of which were said to be receding. One in particular that has already caused a lot of attention in the media, is Exit Glacier. 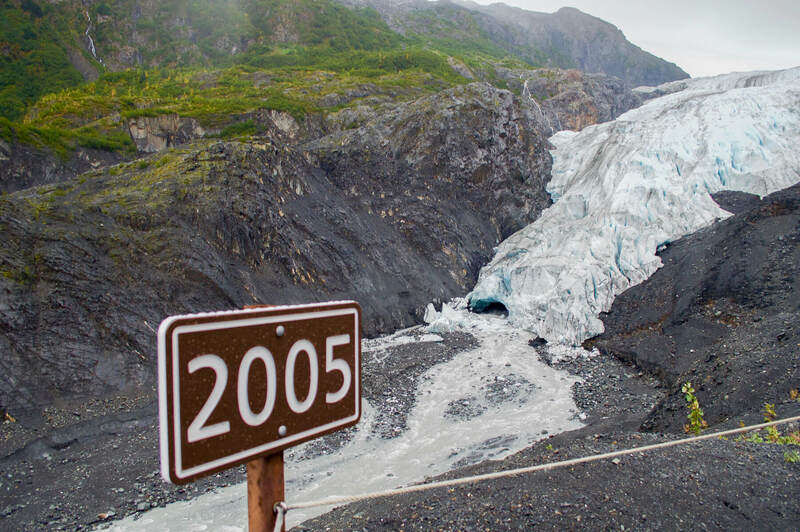 Exit Glacier is derived from the very impressive Harding Icefield in Kenai Fjords National Park. 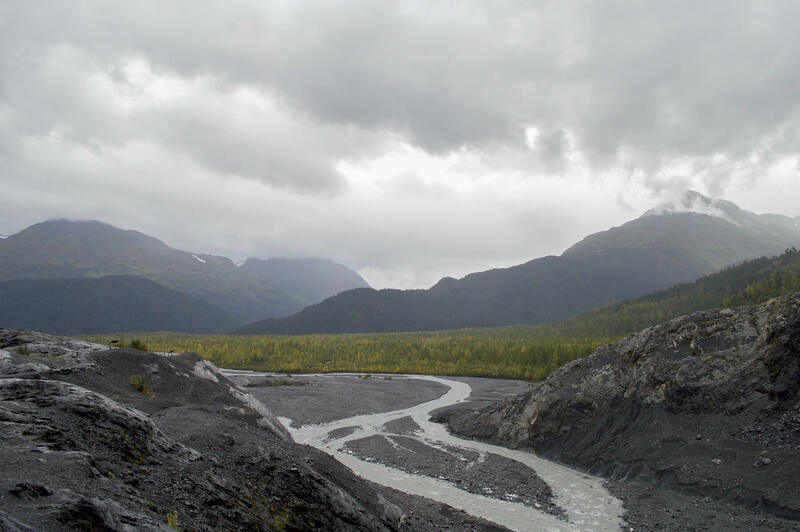 It’s a beautiful landmark that many people infamously know for being the fastest receding in Alaska – before you visit Exit Glacier for yourself, there are certainly a few things you should know… It’s easily accessible and surrounded by an abundance of natural beauty, but climate change is something you’ll be sure to encounter. Almost every person I stumbled across on my one week journey told me about the noticeable difference in temperature across the state. The last winter was very mild; snow levels in areas where 100 ft is common, were down to only 20 ft. Heavy rainfall was so frequent, they had up to 28 days of non-stop precipitation. And guess what! All of these things are a result of global warming. If you are unable to see the proof then I honestly don’t know what will – don’t be that guy. Alaska’s ocean temperatures reached a record high in July. When the water temperature rises, heavy rainfall and mass amounts of precipitation occurs.. and what comes next? Glaciers fall apart, glaciers melt and glaciers make our oceans continue to rise. Exit Glacier in the 2 weeks prior to our arrival had receded significantly. This glacier, that once engulfed the national park by whole, was falling apart and gushing water like I had never seen before. Out of all the glaciers I have seen throughout my lifetime, nothing has ever been this intense. I’m certainly not saying that this retreat began within the last decade, nu-uh. It has been retreating since long before you and I have been alive. Between 1914-1917 Exit Glacier receded 92 metres per year (302 ft). 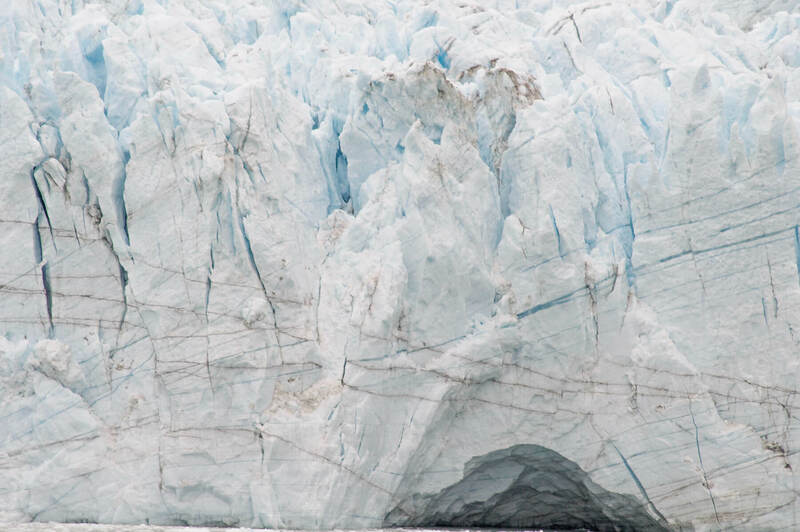 Glaciers are constantly growing and receding depending on the weather, but the problem in our world today is that the growth is simply non-existent. 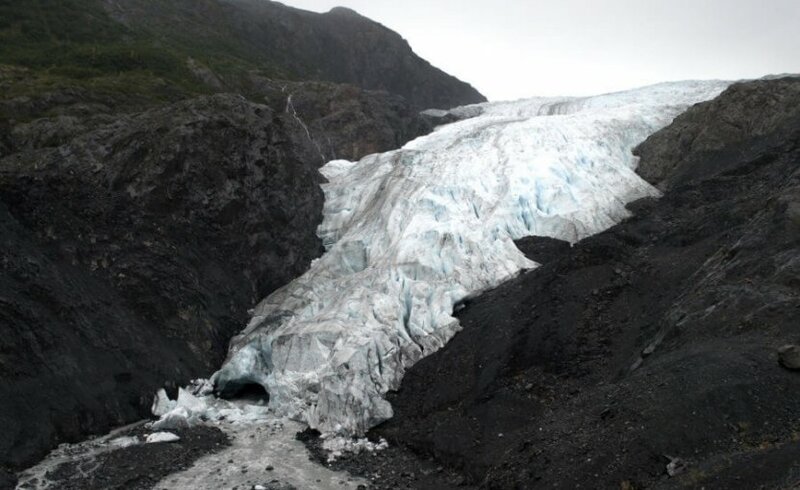 Between 2014-2015 the glacier receded 57m (187 feet) a huge amount. And in 2016 the estimated retreat is a whopping 80m (262 ft). So what really happens when glaciers melt? Rivers flood, sea levels rise, habitats are destroyed, natural disasters occur (well not so natural I guess) and homes, lives and nature are basically destroyed. Water used to be a trickle from this glacier, but now it is a gushing river flowing straight into our already full ocean. And I’m sure you might be thinking; 1 glacier out of 100,000.. that can’t be doing much damage? Think again! 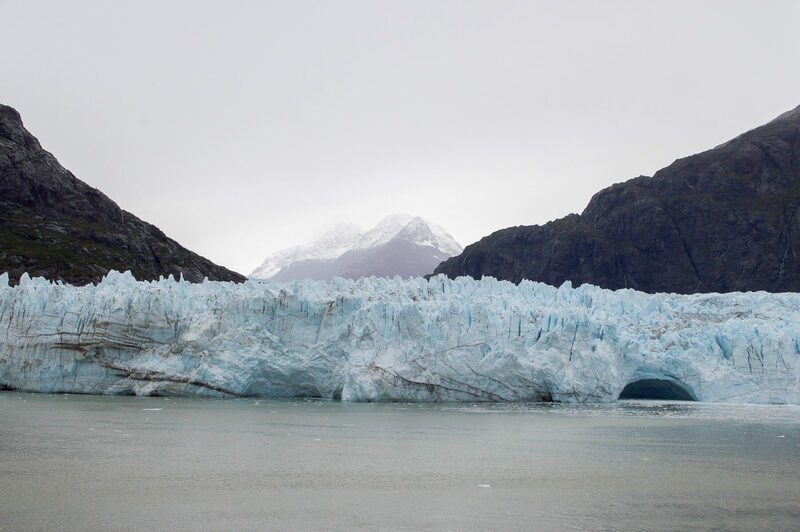 95% of Alaska’s glaciers are receding, and more than 90% of glaciers across the globe are doing the same. That’s a lot of water. Lots of water = a hell of a lot of damage. Glacier Bay, the most magical place on earth in my eyes, was falling apart right in front of my eyes. Glaciers will always move on their own, it’s a natural occurrence. Without this movement, we would be engulfed under miles of snow above our head. Their movement is due to gravity and the immense amount of pressure created from the ice, so it is natural for cavities to form and for the ice to break… But not to the extent of recent times. Glacier Bay is 3.3 million acres of rugged, world heritage national park. Cruising through this park was literally glacier heaven; there was one at almost every turn. The Rangers on board our cruise ship who have worked, lived and cherished this park for years of their life, spoke about the devastating thinning of these beautiful natural wonders. 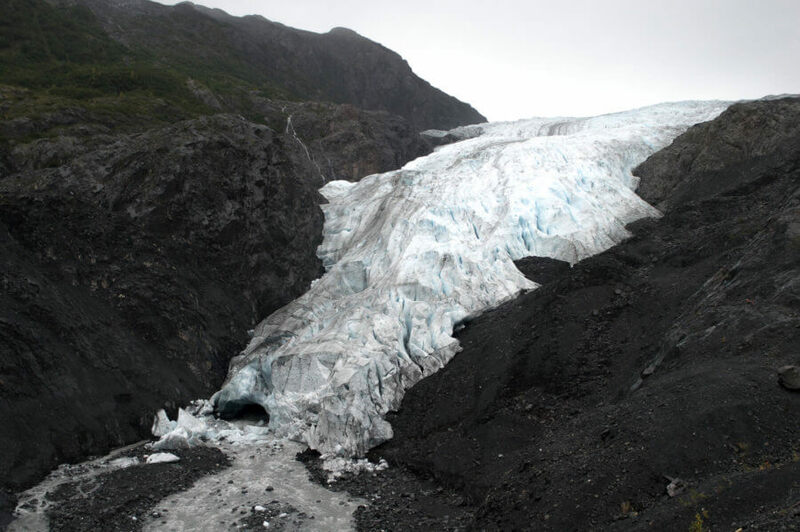 When looking at the face of the magnificent Marjorie Glacier, huge portions of the glacier were crashing to the floor inside caves that had formed on their own. Ice carving can commonly occur from tidal waves, but in this instance, that was not the case. Huge caves had formed in the face of this glacier, and in the small amount of time that they were there, the opening almost doubled in size. Our world is warming people, I have witnessed it first hand and I want you all to know that yes… it’s really here. Yes, the world is really melting. And sadly, it’s not just sea levels that are a concern. Alaska’s seasons have been arriving a lot earlier than normal, extreme weather conditions are occurring all year round and animals are becoming extinct from habitat destruction and drastic changes in climate. Homes along the coast of Alaska are collapsing from the ground that is eroding beneath them and the native Americans are struggling to find food. Travel is so important right now. If you want to see the natural wonders of our world before mankind destroys it, you better get moving. Exit glacier will be gone in a matter of years, glacier bay could be nothing but a bay in a short matter of matter of decades, and your homes could be engulfed in water in a simple matter of time. This is a problem I hope you can click away from this post wanting to do something about. Think about the way you live, think about the impact you have on the planet and think about the small changes you can make to keep these parts of nature from becoming nothing but a piece of history. Help save the beauty of our world, so that our future generations have the opportunity to experience it too. We don’t want our children, grandchildren and great-grandchildren to have to learn about glaciers through a book. Let nature be nature, let’s not destroy it with our ignorance. Disclaimer – I’m well aware that the world isn’t literally melting… It’s the ice! The title of this post simple comes from a question that I frequently hear. Real good work Kate. I am with you, seeing much disappear in my lifetime. I have enjoyed and am sharing your work.